This page contains information on building and using the Brunomter. The device is free of charge and can be downloaded from this page. Follow the links below to get started. 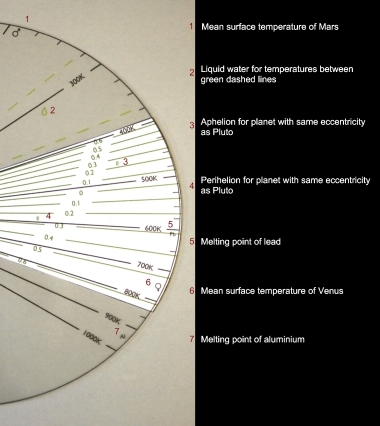 It is a hand-held mechanical device that allows you to work out the surface temperature on planets. It is named in honour of Giordano Bruno, an Italian philosopher burnt at the stake by the Roman Inquisition in 1600. Amongst Bruno’s teachings was the idea of a vast number of inhabited worlds spread throughout the universe. The Brunometer will allow you to work out if newly found extrasolar planets might harbour water-based life. The device has three movable parts that are connected together by an eyelet, about which they can turn. A finished Brunometer is shown below. Click on the image to view it at a higher resolution. In order for the Brunometer to work correctly, the size of the images should not be altered. When printing the downloaded files, use the printing options to shrink the image so that it fits an A4 page. Smaller files will be added to the website in the near-future. 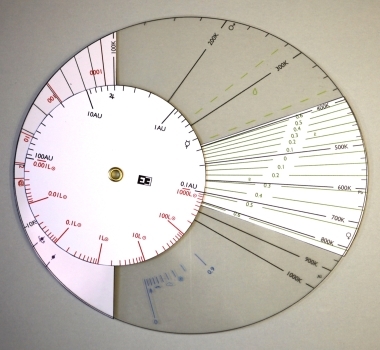 To build a Brunometer you will need to download and print the images from the two links above. 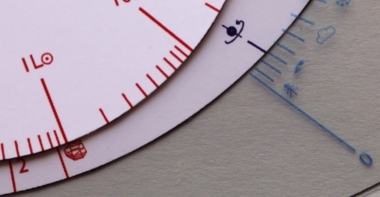 It is important that the acetate picture is printed onto an A4 sheet of acetate. The image of the card pieces should be printed onto an A4 sheet of thin card. The Brunomter should be printed in colour. The device will work correctly if printed in black and white. However, a colour printed version is a lot easier to use. After printing the images, carefully cut around the templates on the card and acetate, keeping your scissors on the outer edge of the black line. After you have done this you should have three separate pieces. Carefully make a small hole in the marked location on each of the the three pieces. Push the eyelet carefully through the circular card disc. Now add the acetate ellipse onto the eyelet making sure that it is the right way up (see picture above). Finally add the crossbow shaped card piece onto the eyelet, again ensuring that it is the correct way up. Now hammer the eyelet closed on the rear of the Brunometer. Packets of eyelets come with an attaching tool to make sure the eyelet flattens uniformly. Finally make sure that all three parts can rotate but are not loose. This is a quick-start guide to using the Brunometer. Illustrations have been included as an additional aid. Higher resolution images can be viewed by clicking on the picture of interest. First you decide whether you are interested in a spinning or non-spinning planet (the dark blue symbols). Then you must decide how reflective your planet is. This is called the albedo. The albedo scale is in steps of 0.1. An albedo of 0 means the planet reflects none of the incident radiation. As you can see from the icons, cloudy planets reflect more than forest planets. In reality the albedo of a planet is not constant over the entire surface of the planet. However, an average albedo is sufficient. The albedo of the Earth is about 0.3 so we’ll take this value and set the rotating planet dark blue line against the 0.3 albedo line. Keep the spin and albedo icons aligned. 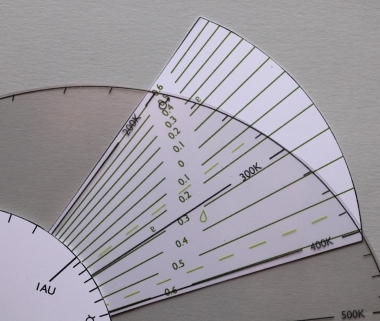 Now rotate the circular dial until the star’s luminosity is aligned with the thickness of the atmosphere. The symbol LO means the luminosity of the Sun. The greenhouse icon here reminds us that this part of the dial is about the atmosphere of the planet. 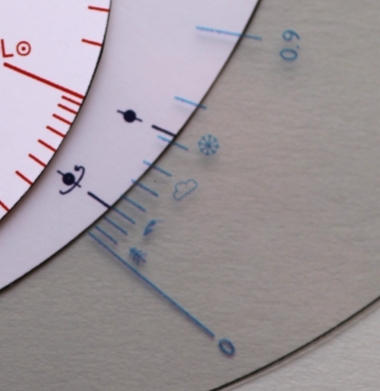 The greenhouse icon itself sits on the point on the dial corresponding to no atmosphere. 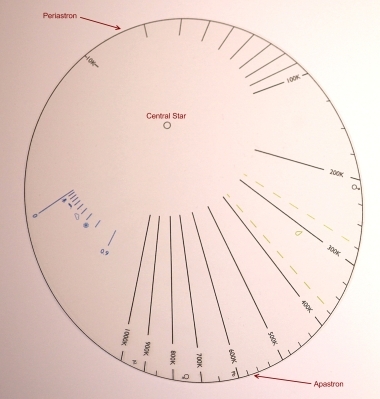 So here we’ve aligned the Brunometer for a star like the Sun (i.e. with luminosity 1 LO) but a planet without an atmosphere. Keeping both your settings fixed, you must now decide how far your planet is from the star. 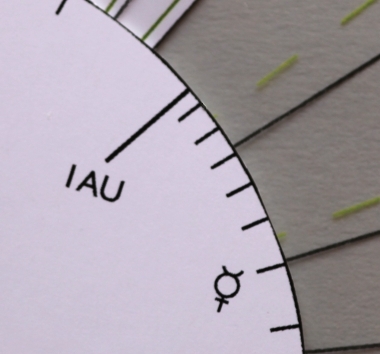 This distance is measured in a unit called the Astronomical Unit (AU). 1 AU is the mean distance of the Earth from the Sun. The temperature on the elliptical dial opposite the distance you have chosen for your planet is the surface temperature of the planet. To read off the temperature more easily, you can use the crossbow-shaped piece. Keep the circular dial and the elliptical dial fixed. Now rotate the crossbow-shaped piece until the 0 marker aligns with the distance (in this case 1AU). Follow the line up and you will see the surface temperature of the planet is just over 250K. Clearly the Earth is warmer than this so we see that adding an atmosphere raises the temperature of the planet. Repeat the settings we have just used but now try adding an atmosphere i.e. set 1 LO next to a value such as 2 on the atmosphere scale – the number on this scale is sometimes called the optical depth of the atmosphere. You should find the average temperature rises to a value similar to the one we experience. The green dashed lines on the elliptical dial show the temperature range for which water is a liquid and this is sometimes used to define a habitable zone – a range of distances around a given star where we might find life as we know it. The unbroken green lines on the ‘fan’ are labelled with numbers running from 0 to 0.6. This number is the eccentricity of the orbit. Planets move around their stars in ellipses. A circle is a special ellipse with eccentricity equal to 0. As the eccentricity increases the orbit becomes more elliptical. 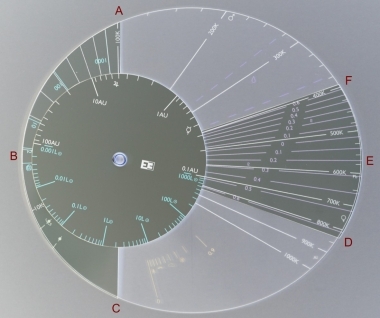 The elliptical dial on the Brunometer has been designed to have the same eccentricity (e = 0.432) as the orbit of Comet Holmes with the eyelet representing the position of the Sun. You can see that the comet is closest to the Sun at perihelion (called periastron for a general star) and furthest away at aphelion (called apastron for a general star). The temperature on the surface will vary as a result; it will be hotter at periastron than apastron. 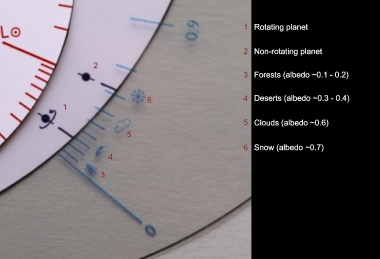 Assuming the planet has time to reach the equilibrium temperature at these points, you can use the fan to tell you the corresponding range of planetary surface temperature for a planet on an elliptical orbit. For instance in the picture above, we can see that if the eccentricity is equal to 0.6, then the temperatures vary on the planet’s surface from 200K to 400K. Most of the seasonal variation of temperature on the Earth comes from the tip of the spin axis and not from the very mild eccentricity of the orbit (e = 0.017). The curved sections on the crossbow-shaped piece have been designed to illustrate Kepler’s Second Law of planetary motion – a planetary orbit sweeps out equal areas in equal times. So the time it takes Comet Holmes to traverse either of the two curved arcs (ABC or DEF) is the same. Look how much shorter the arc DEF is at the end of the fan: you can see that comets and planets move slowest when they are farther from the Sun. The Brunometer consists of a number of symbols. The meaning of each symbol is summarised in the figures below. High-resolution versions can be accessed by clicking on the images. The Brunometer can be used to solve a wide variety of problems. Some example questions are listed here. A fully structured activity book will be added at a later date. A rotating planet with no atmosphere is orbiting a star at a distance of 1 AU. If the star has 10% the luminosity of the sun, determine the change in effective temperature that the planet will experience if the fraction of incoming radiation that is re-radiated into space (albedo) changes from 10% to 90%. The Brunometer is currently a prototype. Several modifications and improvements will be implemented into the design in the near-future. A summary of improvements associated with this item is listed below.